Pressure Management and Plume Control Strategies through a Brine Extraction Storage Test at the Devine Test Site is funded by DOE's Carbon Storage program, which focuses on developing specific subsurface engineering approaches that address research needs critical for advancing carbon capture and storage to commercial scale. The work will be performed in partnership with GE Global Research. 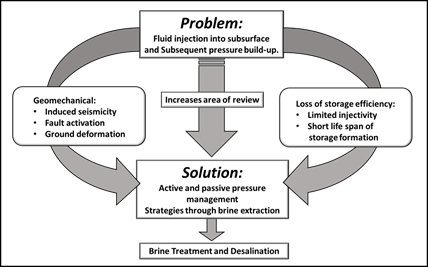 Pressure management through brine extraction can solve many of the problems associated with injection of CO2 for geological storage. Extracted brine through this process can be fed into brine treatment and desalination units for water recovery. The schematic for the Active Pressure Management Strategy (APMS) shows the storage zone where CO2 would be injected. 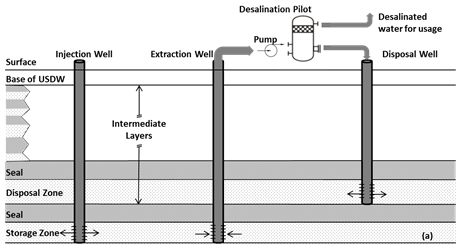 An extraction well that extends to the storage zone would be used to actively pump brine from the storage zone to the surface to control pressure buildup in the storage zone. The brine can be treated at the surface and the treatment residuals would be disposed of into a distinct geologic unit. The project will test active brine extraction wells, passive pressure relief wells, and combinations of both, to control the pressure buildup in the storage formation. Under each pressure management strategy, a complete life-cycle analysis for brine, along with brine handling strategies, will be developed. The proposed study will include some lab and pre-pilot scaling work to obtain the design parameters for Phase II. The proposed field site is the University of Texas at Austin's Devine test site.